Some companies introduce entirely new cars at CES, other companies are just in town to peddle smaller things, like components. Hyundai, meanwhile, was in Las Vegas on Monday just to announce the name of their next fuel cell car. It will be called Nexo. Nexo! We’ve seen photos of the Nexo before, but haven’t seen it in the flesh yet. It appeared Monday on stage and looked like a lot of cars these days: extremely crossover-y. 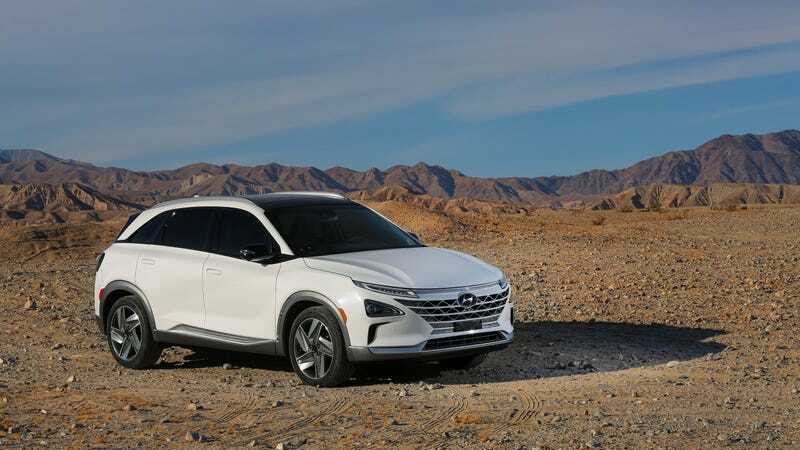 Hyundai said that Nexo will start appearing at dealerships by the end of this year. LFA automatically adjusts steering to help keep NEXO centered in its lane of travel. LFA can keep NEXO centered at speeds between 0 and 90 miles per hour on both highways and city streets. When paired with Hyundai’s Highway Driving Assist (HDA) which utilizes sensors and map data to ensure safe operation as well as automatically adjust speed in limited environments, drivers will be able to traverse long distances with greater ease and improved safety. The Nexo is partially electric, and Hyundai says the car has a range of 370 miles and represents a 20 to 30 percent power boost over its first-generation fuel cell vehicle, the five-year-old Tucson. The Nexo can go from zero to 60 mph in 9.5 seconds, or three seconds quicker than the Tucson, Hyundai says. The real news here, though, is the name. Nexo. Nexo. Nexo. Is Nexo good or bad?